Leading German ceramics manufacturer Villeroy & Boch (V&B) is optimistic of attaining double-digit growth again this year, on the back of the popularity of its new product launches. Last year the company achieved all its targets without exception, Dr Stefan Dillschneider, regional sales manager Near/Middle East, tells Gulf Construction. He further says: “Despite uncertainties in the emerging economies, the company expects the global economy to enjoy a slight upturn in 2016 compared with the previous year thanks to the positive outlook for the euro zone. The Squaro Prestige ... a refinement of the Squaro Edge 12 bath design. Among the innovations launched on the region market are new taps, washbasins and bathtubs. The latest taps launched in the Gulf perfectly match the design, quality and diversity of Villeroy & Boch’s washbasins, shower trays and bathtubs, he says. With four new series – Classic, Subway 2.0, Architectura and O Novo – the company provides more options in bathroom planning by extending its mainstream and professional tap range. “On the premium level, we introduced Domicil, a new classic three-hole basin mixer with traditional bathroom-style elements in a reduced and timeless form to create a design language with universal resonance,” Dr Dillschneider says. The company has also presented a range of exclusive premium products to the Gulf market, including the Squaro Prestige bathtub, and Octagon and Artis washbasins. Squaro Prestige is a refinement of the Squaro Edge 12 bath design, which won the Interior Innovation Award 2014, and represents “elegant uniqueness”. “Each product is elaborately hand-decorated in a German production facility, with the base of the tub alone requiring approximately 32 working hours to decorate. 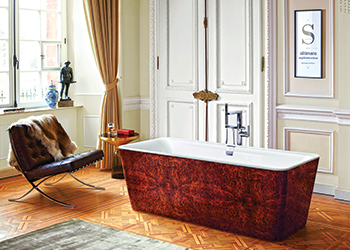 The product is available in real wood veneers – Dark Chestnut, Rouble Burl Wood, Satin Walnut, Yew, European Oak and Smoked Oak – and finished with a lacquer coating, thus making each tub unique,” he explains. 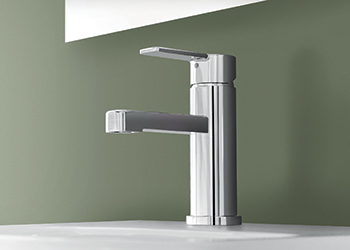 Meanwhile, the countertop washbasins in the new Artis series excel through their particularly thin and delicate ceramic. The fine, lightweight-looking bathroom sinks are available in four shapes: round, oval, rectangular and square. The deep, functional bowls not only look attractive but also provide optimum user convenience. V&B’s Artis series responds to the current global design trend towards delicate shapes. The Artis series, in fact, respond to the current global design trend towards delicate shapes, where extremely fine lines and slim edges are realised with highest precision in simplified shapes. 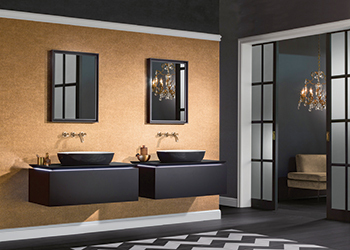 With the Artis surface-mounted sink series and the Octagon column bathroom sink, Villeroy & Boch is implementing this trend in a novel bathroom ceramic. With another innovation, Venticello, V&B achieves this trench in a complete bathroom collection. 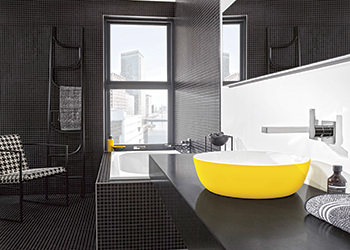 Also, modern bathrooms make a bold statement and are not afraid to experiment with colour. 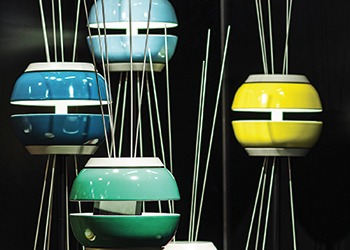 Inspired by the kaleidoscope of seasonal colours in Paris (France), German-Danish designer Gesa Hansen has developed some trendy colours for the premium Artis washbasins. And complement these striking washbasins, the La Belle, Squaro Edge 12 and LoopandFriends baths now reveal a new look. These attractive dual-colour baths make strong style statements on their own or complemented by a coordinating washbasin. The latest taps launched in region ... match the design, quality and diversity of V&B’s washbasins, shower trays and bathtubs. Elaborating on the market in the Gulf region, Dr Dillschneider points out that while several products were put on ice following the global financial crisis, the announcement that the World Expo 2020 would be held in Dubai — marking its debut in the Gulf region – has given a new lease of life to many projects and masterplans. “In addition to Dubai, Qatar is the other most exciting market in the region at present because of the Fifa World Cup 2022. As Qatar is not yet an established tourist destination, massive investments will be required over the coming years, particularly in hotel capacities to accommodate the huge numbers of international guests that are expected,” Dr Dillschneider says. In the projects market, Villeroy & Boch is working with the key architects, interior designers and planners in the region. Its hospitality clients in the Middle East include major hotels such as Four Seasons (Bahrain), Kempinski, Hilton (Doha, Qatar), Ritz Carlton, Grand Hyatt, The Address, Damac Lotus Towers, Meydan, Sofitel on the Palm and Madinat Jumeriah (all in Dubai, UAE), and Fairmont and Raffles (Makkah, Saudi Arabia). Dr Dillschneider says V&B is well-positioned to meet the needs of the regional market. “We currently have a very good set-up to serve the region well and, of course, we are constantly renovating existing showrooms and opening up new ones in liaison with our Middle East partners,” he says. The company has an office in Dubai, with three employees, to looks after its Gulf business in Bahrain, Kuwait, Saudi Arabia, Oman, Qatar and the UAE. “In each country, we have long-term business relations with local partners based on trust and reliability. Thanks to these partners, the brand Villeroy & Boch enjoys an outstanding reputation in the region,” he adds. At Villeroy & Boch, reducing water consumption has always been a major issue, according to Dr Dillschneider. V&B’s next milestone in its drive towards sustainability was the introduction in 2009 of its Architectura GreenGain, the first wall-mounted WC that consumes just 3.5 litres of water per flush. “This represents a reduction of 2.5 litres per flush on the normal flushing volume and therefore corresponds to a saving of 40 per cent. If the lower flushing volume is selected when using the DualFlush system, the WC will only use two litres of water per flush. And for highly frequented areas, Villeroy & Boch has specially designed the AquaZero urinal with eliminates the use of water in the flushing process,” he says. The AquaZero urinal, which utilises innovative siphon technology, combines outstanding ease of maintenance with optimum economy and safe hygiene.